Calc’s window has several different parts. These parts are similar to the parts of the Writer window. The only unique component is the Formula bar. However, each of the other components differ from their counterparts in the other LibreOffice applications. The titlebar the same regardless of the application the document is open in. It is the same in Writer, Calc, Impress, and Draw. The menu bar has the following items in it. Most of these menus can be found in Writer and Impress as well. Each application has different items in the menus they have in common with other applications. Sheet and Data are the menus that are unique to Calc. File: This menu contains items to create a new document, save a document, access remote servers, to access templates and wizards, and print a document. Edit: The menu has items to copy, cut, and paste text and other items. It has items to search and replace text in a document. View: The items in this menu include ones that allow you to open each one of the toolbars, open or close the sidebar, open and close the navigator, and access the data sources. Insert: The items here include ones to insert images, charts, and shapes. Format: This includes items to format rows, columns, sheets, and images. Sheet: In this menu, you can insert or delete cells, columns, rows, and sheets. All of its items also can be found in toolbars, the sidebar, and context (right-click) menus. Data: This menu has items to sort, calculate, and filter data in cells. Tools: This menu gives you access to spelling, grammar, and language tools. These include spellcheck and grammar check. It also has items to protect cells and perform macros. Window: This allows you to see which documents are open and allows you to select that document, so you can work on it. Help: This gives you access articles about the different features of the LibreOffice suite and Calc. The two unique menus that Calc has are Sheet and Data. This allows you to add columns and rows or delete them. It also allows you to perform various functions on the Sheet, such as renaming it or adding another one. You also can connect to external files and sheets. You also can add comments to a cell and perform other functions. This menu allows you to sort data in selected columns. It allows you to apply various filters to the data in the cells. You can create a pivot table from this menu and look at statistics. New: This allows you to open the same type of document you are working on. For example, if you are working on a spreadsheet, the icon will be of a spreadsheet, so when you click it, the new document will be a spreadsheet. The drop-down menu allows you to create any type of document that LibreOffice can open. These include spreadsheets, XML forms, and HTML documents. Open: This will open a dialog where you can search your computer for documents to open. The drop-down menu lists documents that were recently opened with LibreOffice. Save: Clicking this will save the document. The drop-down menu has the following items: Save As, Export, Save as Template, and Save Remote File. Export as PDF: Clicking this opens the Export dialog. Print: This opens the Print dialog. Toggle Print Preview: This opens the print preview and let’s you see how the document will look when it is printed. Cut: This will remove selected text or objects from the document and places them on the clipboard, so they can be placed elsewhere in the document or in another one. Copy: This will place selected text or objects from a document and places them on the clipboard, so they can be placed elsewhere in the document or in another one. The text and objects will not be removed from there current location. Paste: This places the text or objects on the clipboard into a document, where the cursor is located. Clone Formatting: This allows you to copy the formatting of selected text and apply it to other text. Clear Direct Formatting: This will clear all formatting that you applied to text, such as underline. It will not clear formatting applied by a template. Undo: This will revert the document back before the previous change. The drop-down menu lists the past few changes and lets you go back to the document when that change was the last one made. Redo: This will restore a change that was just undone. The drop-down menu lists changes that you have undone. Click the desired change to bring the document to the point where that was the last change made. Find & Replace: Clicking this opens the Find and Replace dialog. Spelling: This spellchecks the document and opens the spelling dialog. 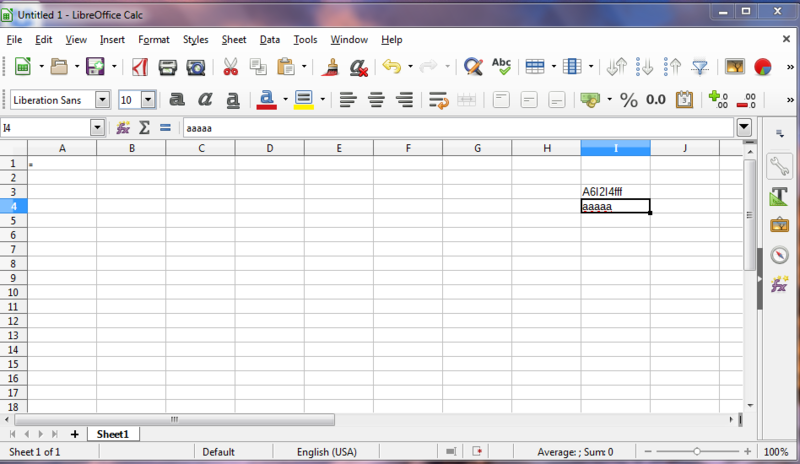 Row: This is a drop-down menu that has several items for inserting and deleting rows. Column: This is a drop-down menu that has several items for inserting and deleting columns. Sort: This opens the sort dialog. Sort Ascending: This sorts a selected column in alphabetic and numeric order. Colums with only digits come first. Sort Descending: This sorts a column in reverse alphabetic and numeric order. Columns with only digits come last. AutoFilter: This puts a combo box on the first cell of a selected column. The combo box contains items for sorting the column. Insert Image: This opens a dialog to search your computer system for an image to insert. Insert Chart: This inserts a chart into the spreadsheet and opens the chart dialog. Insert Pivot Table: This opens the Source Selection dialog that allows you to choose either the current selection of cells or a source that has been registered in LibreOffice. Insert Special Character: This opens the Special Characters dialog. Insert Hyperlink: This opens the Hyperlink dialog. Insert Comment: This opens a comment box for the selected cell. Headers and Footers: This opens the Headers/Footers dialog. Define Print Area: Select the range of cells you want to print, click this icon, and then press the Print command. You will only see in the print preview the range of cells that you have selected. Freeze Rows and Columns: If you have long rows or columns of data that extend beyond the viewable area of the sheet, you can freeze some rows or columns, which allows you to see the frozen columns or rows as you scroll through the rest of the data. Select the row below, or the column to the right of the row or column that you want to be in the frozen region. Then click this icon. All rows above, or all columns to the left of the selection are frozen. Split Window: Click on a column then click the split window icon to isolate the the columns to the left of the selected button. Draw Functions: Clicking this icon opens and closes the Drawing toolbar. Font Name: This drop-down menu allows you to select one of the many fonts available. Font Size: This allows you to choose several popular font sizes. It is also a text box, so you can type a font size. Bold: Select desired cells and text, then click this to make that text bold. Italic: Select desired cells and text, then click this to make that text italic. Underline: Select desired cells and text, then click this to underline the selected text. The drop-down menu gives you additional options. The More Options button launches the Format Cells dialog. Font Color: Click desired cells and text, then click this icon to change the color of text in the selected cells. The drop-down menu reveals other color choices. Background Color: Click desired cells, then click this icon to change the color of the cells in the selected cells. The drop-down menu reveals other color choices. Align Left: Text in cells can be aligned three ways: Align Left, Center Horizontally, or Align Right. This choice puts the left most character in a cell close or against the left wall of a cell. Select multiple cells to Left align text in all the cells. Center Horizontally: Text in cells can be aligned three ways: Align Left, Center Horizontally, or Align Right. This centers the text in a cell. Select multiple cells to center text in all the cells. Align Right: Text in cells can be aligned three ways: Align Left, Center Horizontally, or Align Right. This choice puts the right most character in a cell close or against the right wall of a cell. Select multiple cells to Right align text in all the cells. Wrap Text: Wrap text makes the text in a cell fit in it without increasing its width. Move the contents of the hidden cells into the first cell. Keep the contents of all hidden cells. Empty the contents of the hidden cells. Align Top: Clicking this will align the text in the selected cells so it is against or near the top wall of the cell(s). Center Vertically: This aligns text in selected cells so it is aligned vertically in the cell. The text could still be aligned so it is near the left or right walls of the cell(s). Align Bottom: Clicking this will align the text in the selected cells so it is against or near the bottom wall of the cell(s). Format as Currency: Click this when a cell with a number with number is selected. It will place a dollar sign (or other currency symbol) to the left of the number and round any digits to the right of a decimal point. The drop-down menu reveals a list of other currencies to choose from. Format as Percent: This will convert a number in a selected cell or group of cells to a percentage. Format as Number: This will add decimal decimal places to whole numbers or round a number with decimal places to a number with two decimal places. This works on multiple cells, as well as a single cell. Format as Date: This converts numbers in selected cells into their corresponding dates. Add Decimal Place: This will add an additional digit to the right of the last number after a decimal point in the selected cell(s). Delete Decimal Place: This will remove one digit that is the last number after a decimal point in the selected cell(s). Increase Indent: This will indent the string of characters in each of the selected cells. Decrease Indent: This will reduce the indentation of the selected cells. Borders: Clicking this opens a drop-down menu with a choice of 12 borders. Choose one to apply to the selected cells. Border Style: This reveals of line styles to apply to the selected cells. Border Color: Clicking this will change the borders of the selected cells to the featured color. The drop-down menu reveals other color choices. Conditional Formatting: This will apply conditional formatting you setup to the selected cells. Click the Manage Names link. Click the Add button in the Manage Names dialog. The Input Line: This is where you type the formula. An icon for the function wizard: This launches the Function Wizard, which has more than 400 formulas to use. A Sum icon: This icon totals the numbers in the cells above the selected cell. Function: This simply places an equal sign in the Input Line. and then places the total in the selected cell. If there are no numbers above the selected cell, then the cells to the left are totaled. An equal sign can be typed directly in a cell. This will change The Sum icon to a Cancel icon and the Formula icon to an Accept icon. Sheet sequence number: This shows the sequence number of the current sheet and the total number of sheets in the spreadsheet. The sequence number may not be the same as the name on the sheet tab if sheets have been moved. Page style: This shows the page style of the current sheet. Insert mode: This shows the type of insert mode the program is in. It is either Insert mode or Overwrite mode. Insert mode is normal typing mode. Click a cell so the cursor is flashing in it. Then type the desired characters. The cursor moves to the right in the cell after each character is typed. Old characters will be move to the right. Overwrite mode is used when you want to replace old characters with new characters in a cell. As you type., the new characters will overwrite the old ones that are to the right of the flashing cursor. You can change between Insert mode and Overwrite mode by pressing the Insert button on your keyboard or by clicking on the section. First your cursor needs to be flashing in the cell you want to add text to or edit. Selection mode: Click to open a context menu and toggle between. The icon does not change when different selection modes are selected, but the tooltip shows the current status. Standard selection: Click in text or cell where you want to position the cursor and make the cell active. Any other selection is then deselected. Extended selection: Clicking in the text either extends or crops the current selection. Adding selection: A new selection is added to an existing selection. The result is a multiple selection. Block selection: A block of text can be selected. Unsaved changes: This icon indicates if there are any unsaved changes that have not been saved. Double-click this icon or use one of the other methods to save the document. Digital signature: If the document has been digitally signed, an icon shows here. You can double-click the icon to view the certificate. Cell or object information: Displays information relevant to the position of the cursor or the selected element of the spreadsheet. When a group of cells is selected, the sum of the contents is displayed by default. Right-click on this field and select other functions, such as the average value, maximum value, minimum value, or count (number of items selected). Zoom slider: Drag the zoom slider, or click the + and – signs to change the view magnification. Zoom percentage: Indicates the magnification level of the document. Right-click on the percentage figure to open a list of magnification values from which to choose. Double-clicking on this percentage figure opens the Zoom & View Layout dialog.